Who wants to sail to Pt. Reyes? Our annual Spring Dinner will be at the always friendly, Sausalito Cruising Club (Thank You, Lowell Jett!). This year we're planning to have a Cruise-in and Triton workshop (schedule to be announced; we're still organizing it). The dinner this year will be a your-choice barbecue. "Your choice" is to either bring something to barbecue or, for a couple of bucks, buy a TODSF burger from Secretary/Treasurer/Burgermeister Ann Gilleran. TODSF will have a supply of tossed green salad, pasta, potato salads and a selection of rolls and breads and dessert. All this for only $8/person (plus the meat). The club bar will be open for our enjoyment. There is room at the dock to fit in a number of Tritons. In '94 we had eight-or-so parked stern-first to the dock. Cruisers are welcome to spend the night (see the "by boat" instructions below). 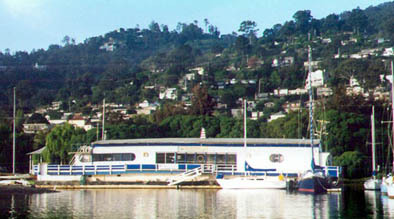 Sausalito Cruising Club is an easy walk from downtown Sausalito. By car: It's right next to Cass' Marina. Go north of downtown Sausalito on Bridgeway (the main street) to Napa St. Turn towards the bay on Napa St. There it is! By boat: The Cruising Club's on a barge next to Cass's Marina, #65A on your chart. Get to the dock by going north of the small island in front of the Cruising Club. The tides are such that you should be able to easily get in any time after noon on Saturday. There's a -0.5 tide Sunday morning at 10AM, so if you don't leave the dock before about 6:30AM you'll be hanging around with Dogstar until ~1PM, enjoying a lazy morning in Sausalito. For the 40th (+-) consecutive year TODSF will be doing one design racing on San Francisco Bay. This year Racing Chariman Ely Gilliam has set up a 10 race schedule on five different courses; Vallejo, City Front, Knox, Treasure Island and South Bay. You'll find the detailed schedule on page 1. Nine of the races will be YRA races and the tenth will be at the Plastic Classic Regatta, on July 15, which will also be the race for the Coveted Perpetual Trophy. Working sails only on that one, followed by a fine party at the reknowned Bay View Boat Club. Culminating the racing season will be the 29th National Regatta at the Corinthian Yacht Club. Finally, confused/intimidated/put-off by "all these rules"? Latitude 38 has put together a racing rules primer reprinted on the next page. They're all we ever really use on Dogstar. It's not written in any rulebooks, but, since sailboat racing is a recreational sport, we think the number one rule should be to have fun. Beyond that, some basic guidelines help prevent collisions and ensure that racing is both fun and fair. Below is an outline of ten basic rules which cover the most frequent racing situations. For completeness and total accuracy, refer to Racing Rules of Sailing 1997-2000 available from US Sailing. 1 . If boats are on the same tack, and overlapped, the windward boat must keep clear of the boat to leeward. 2. Port tack keep clear of starboard tack. 3. If boats are on the same tack, a boat clear astern must keep clear of a boat clear ahead. 4. When tacking or gybing, keep clear of boats on a tack. 5. Avoid collisions. If you have the right of way and hit the other boat, causing serious damage, you both will be penalized. 7. Sail the course prescribed. You have to round the marks in the direction specified in the sailing instructions and can't touch a mark. 8. Proper Course (same tack, ahead, within two hull lengths). Don't sail above the proper course on a beat, or below the proper course going downwind. a. When the overlap did not exist before the lead boat reaches the two-hull-length circle. b. To "bargers" at the start except to avoid collision (then protest). 10. Acknowledge your fouls and protest those who don't. Clear Astern and Clear Ahead; Overlap -- One boat is clear astern of another when her hull and equipment in normal position are behind a line abeam from the aftermost point of the other boat¹s hull and equipment in normal position. The other boat is clear ahead. They overlap when neither is clear astern or when a boat between them overlaps both. These terms do not apply to boats on opposite tacks (unless rule 18 applies). "Barging" means coming up from behind to squeeze between the committee boat and another racer. It can get you in trouble. Your "proper course" is the course you would sail to the next mark if the other boat were not there.